People of all ages in Western Europe value the importance of the news media in society. 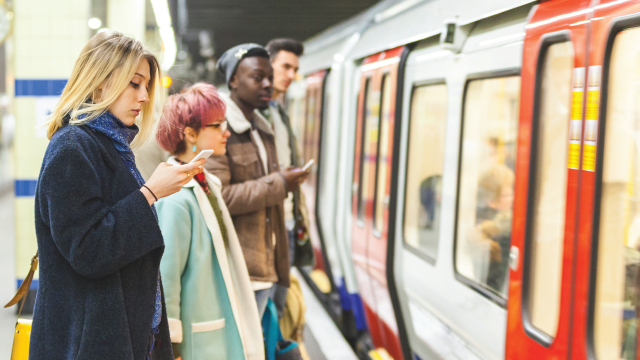 Yet, younger adults – those under 30 – are less trusting of the news media and less likely to think the news media are doing a good job in their key responsibilities. And while younger adults rarely read the news in print, they often name established newspaper brands as their main source of news. 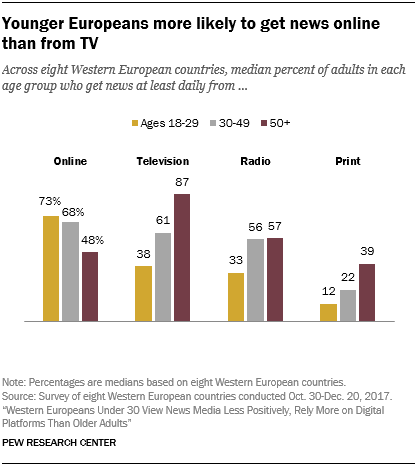 Across the eight Western European countries surveyed, broad majorities in each of the three age groups say that news media are important to society. Among those under 30, the share who holds this view ranges from 75% in Italy to 94% in Sweden. Younger Western Europeans, however, are less approving of the news media. In five of eight countries polled, younger adults, defined here as those ages 18 to 29, are less likely to trust the news media than the oldest age group (those 50 and older). And when it comes to how the news media perform on key functions, in six countries adults under 30 give the news media lower ratings across at least three of the five performance areas measured than do those ages 50 and older. One issue where younger Europeans are noticeably less satisfied with the news media’s performance is coverage of immigration. In Denmark, for example, about half of those under 30 (49%) say the news media are doing a good job covering immigration, compared with 74% of those 50 and older, a gap of 25 percentage points. Similar but narrower gaps in how younger and older Europeans rate immigration coverage are evident in six of the seven other countries surveyed. Modest differences also emerge in ratings for coverage of the economy and crime, with younger adults giving the news media lower marks. These general patterns notwithstanding, the survey finds that Western Europeans under 30 can be more trusting of specific news outlets than older adults. For example, in the Netherlands, 59% of those ages 18-29 generally trust the news media, compared with 65% of those 30-49 and 72% of those 50 and above. Yet, about half of younger Dutch adults (53%) trust the specific newspaper De Telegraaf, compared with 36% of those 50 and older. Additionally, younger Europeans in these countries are almost twice as likely to get news online as they are from television. This stands in stark contrast to those 50 years and older, for whom television is the main pathway to news. At the same time, those ages 30 to 49, who bridge the gap between the youngest and the oldest age groups, also bridge the news consumption gap on these two platforms, with 61% getting news from TV and 68% getting it online. The greater appeal of digital among younger adults and television among the oldest age group is consistent across all eight countries studied, with majorities of those ages 18 to 29 getting news online daily. Within the digital realm, younger adults are also about twice as likely to get news daily through social media than those ages 50 and older. Younger Europeans also get news in print at much lower rates than those older than them. Those under 30 are about half as likely as those ages 30-49 to read print news sources on a daily basis – and the gap is even larger when compared to those 50 and older. But younger Europeans rely on – and trust – newspaper brands, suggesting that their consumption of news is more likely to be through newspaper websites or social media accounts. 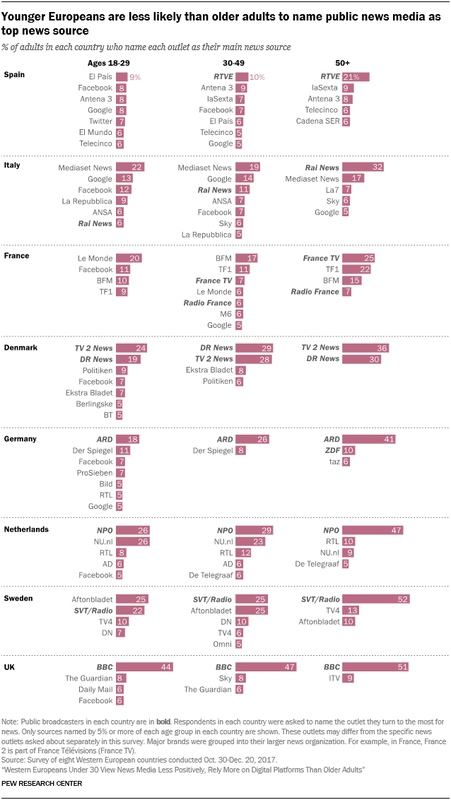 These are among the key findings of a new analysis of a Pew Research Center public opinion study that maps the media landscape in these eight Western European countries. The analysis is based on a survey of 16,114 adults across all eight countries conducted from Oct. 30 to Dec. 20, 2017, including 2,970 people under the age of 30. The survey also asked respondents to name the specific outlet they rely on most for news. Responses to the open-ended question vary by country, but some consistent differences by age emerge across the eight nations studied. For example, in Spain, younger adults name the newspaper El País as their top main news source, while those ages 30-49 and those 50 and older name the public broadcaster RTVE. The UK is the one country surveyed where a public broadcaster (the BBC) dominates as the main news source across all age groups. Second, younger Europeans are much more likely to name social media and search engine sites as main sources of news. In seven of the eight countries, Facebook is named by at least 5% of younger adults. Twitter is also named as a main source by younger adults in one country (Spain), and Google is named in three countries (Spain, Germany and Italy). Across the eight countries, these sites are rarely named by those 50 and older as a main source: Just one site, Google, is named by at least 5% of this age group, and only in Italy.